Welcome back to Crawdads Corner! My name is Andrew Tallent. I am the head groundskeeper for the Crawdads. This has been an exciting and challenging first year back with the 'Dads. I was the assistant groundskeeper in 2009 and the head guy 2010 through 2013. I came back in January to be the head guy again. As part of our offseason renovations we installed a brand-new playing surface. This week I'll take you through a typical game day for the grounds crew. The Crawdads grounds crew includes a seasonal fulltime assistant, 1-2 part time employees and 1 fulltime employee, me. Fans realize you need to the mow the grass, what some people do not know, is it is as hard if not harder to get the dirt in the best possible shape for the game. Most of the work starts the day before the game, making sure the infield moisture is just right. For a 7pm game our typical day starts at 9am. We start off by mowing the field and removing clippings to create the smoothest playing surface possible. 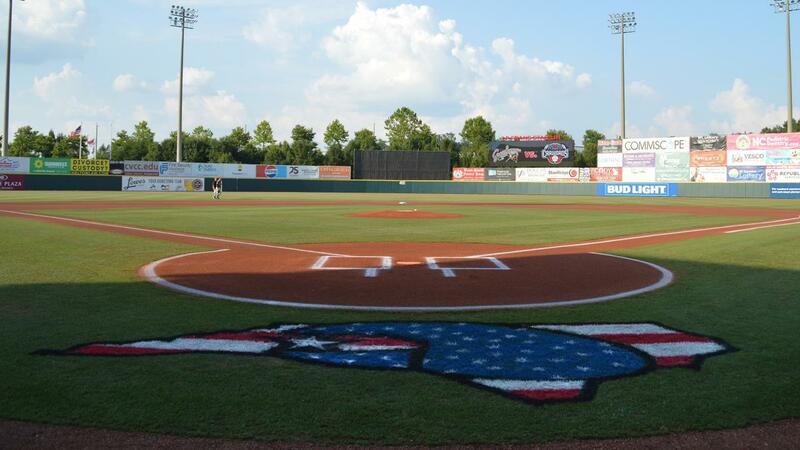 This is the time a groundskeeper can become an "artist" and get creative. Fans are often intrigued by the two-tone dark and light green stripes throughout the field but don't know how they are created. The secret is the direction they are mowed: the two-tone effect is created by pressing the grass in different directions. The next step is to paint the foul lines and coaches boxes in the grass. Once this is complete, it's time to heavily water the infield dirt so the moisture holds throughout the day. How much water will depend on the weather. At this point it is around noon. We will start getting the field ready for early work (this is when players come out before batting practice to get in some extra fielding, pitching or hitting) and batting practice. Batting practice for the Crawdads starts about three hours prior to the game. It requires multiple protective screens and mats. We set them up and break them down every day. There are three turf protectors during batting practice, one that goes in front of the batting cage and two others that will run alongside and around the back of the cage. We put them down each day to keep the turf from getting damaged. There is a pitching platform and an L-screen to shield the coaches while they are throwing to the players. Also two square screens; one is placed in front of first base to protect the first baseman from getting hit while receiving throws from infielders. It also serves to protect base runners. The other screen is placed in front of third base halfway down the base line to protect runners. Lastly there are two tri-fold screens; one is placed in front of second base to protect runners and the other is located in the outfield behind second base to protect players shagging balls hit on the field. Once both teams have taken batting practice it's time to take the cages off the field and get ready for the game. Pre-game set up begins around 6:15. This is where you see the crew getting the field ready for the game. We start by dragging the infield dirt to smooth it out again and get it ready to be watered. Another member of the crew will broom the home plate area, baselines, and mound taking out all imperfections. This person will also paint the pitching rubber. Then we water again. We have to make sure the dirt is perfect, if conditions are too wet or too dry, player safety can become a concern. Again, this is why we start the process the day before. Lastly, the dirt foul lines and batters boxes are painted and we are ready for first pitch. During the game the crew will hand drag the infield every three innings trying to keep the dirt pristine throughout the entire game. Once the game is over, we will begin to prep the field for the next day. We will repair the mound and the home plate area. Then cover both with tarps. Rake the baselines and infield cutouts, drag the infield dirt and put all equipment away until the next day. The final step for the night is to flood the infield dirt to make sure it is ready for the next day. In addition to our normal routine, this year brought various challenges. We had issues with the new playing surface. The new Bermuda grass did not take as well as we would have liked due to the competition with the rye grass. We also had to deal with insects, including armyworms throughout the outfield, and diseases due to the amount of rain this season. These are some of the issues that we had to address through-out the year. All and all it was a good first year back and I'm already looking forward to 2019. Look for me at the first game on April 11th; I'll be the one playing in the dirt! Don't forget to join us for our first-ever Trunk-or-Treat on Monday, October 29th from 6pm to 8pm at LP Frans Stadium. The free event will be a family-friendly way for kids to get candy and will feature ticket deals, discounted food items, free popcorn and Halloween themed games. We look forward to seeing you there!